The DVT treatment plan constitutes PE prevention by keeping the clot from enlarging and breaking, and reducing chances of a future recurrence. As first-line DVT treatments, anticoagulants prevent clot growth and keep new clots from developing. However, they do not destroy pre-existing clots and cause bleeding problems like thalassemia (excess bleeding from even small injuries) in high doses, hence requiring close monitoring. An anticoagulant course generally lasts for 3 months. Anticoagulant injections like Heparin are administered during the first few days, followed by oral anticoagulants like Warfarin. However, since warfarin takes 4-5 days for full effect, most patients are simultaneously given injections and oral medication. Alternatively, DOACs (Directly Acting Oral Anticoagulants) that do not require the aid of injectable anticoagulants can also be prescribed. Similarly, Xa inhibitors work just as well as Warfarin without requiring frequent monitory and testing. Unlike blood thinners, they efficiently break down clots while also preventing further formation by direct injection into the clots. However, thrombolytics can cause severe bleeding and are hence only reserved for Serious cases of DVT and PE, or those that do not respond to primary anticoagulants. Tight at the ankle and gradually loosening up the leg, these elastic stockings use pressure to help move the collected blood and fluid back into the capillaries to prevent DVT-related swelling and reduce the risk of clotting. Covering the leg from foot to knee, compression stockings should be worn daily for at least 2 years following treatment. The type of stocking depends upon a patient’s leg size and clot severity. Paralysed patients or those requiring long-term bed rest may be recommended CPM machines for leg support. 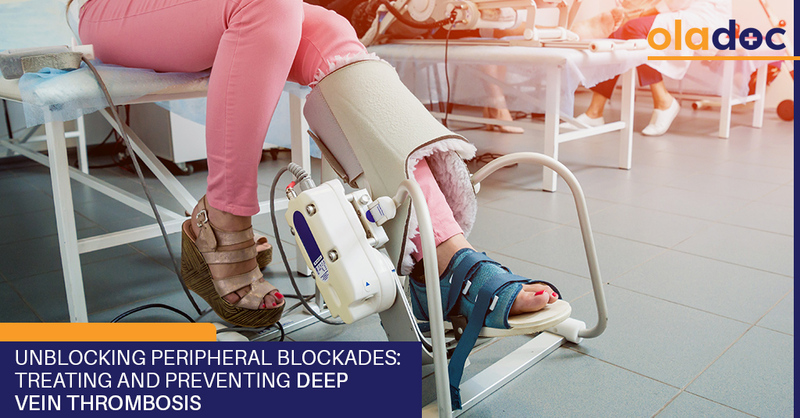 After elevating the leg, a CPM machine slowly moves the knee to retain leg motion and prevent blood clots by improving blood circulation to the leg. Thrombectomy: This involves directly removing the problematic clot from the blocked blood vessel via an incision. Sitting continuously for prolonged time periods is a prime cause of DVT. So stop every hour to walk and stretch if travelling long distances by car. During long flights, walk down the aisles every 30 minutes or exercise your heels and toes while sitting. Instead of fully committing to bed rest, try taking short walks to keep your legs in motion and the blood flowing. DVT and the resultant Pulmonary Embolism can be fatal, but can also be easily resolved with prompt treatment. Check the symptoms if you suspect a case of deep vein thrombosis. You can also book an appointment with top Cardiologists in Lahore, Karachi and Islamabad through oladoc, or call our helpline at 042-3890-0939 for assistance to find the RIGHT Doctor for your vascular concerns. « Why Do We Crave Junk Foods?